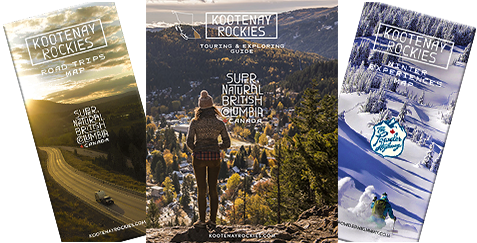 From introducing mountaineering to our country to stopping the western border of Canada from creeping northward, railways have had a significant impact on our Kootenay-Canadian culture and life, as we know it today. Entire industries have arisen from the expansion of this transportation, and the region has witnessed the rise (and fall) of frontier towns that relied on the services connected to the railways. The area was bound to end up on adventure maps eventually; the railroad just gave it a boost. The Kicking Horse River—and its class ‘Fun’ whitewater—made its way into prominence after a scouting party sought to take Canada’s prairie railroad westward through the Rockies. The river, which feeds into the Columbia upon reaching present-day Golden, BC, is a current-day hub for Kootenay paddlers seeking some of the province’s most raucous rapids. But during the days of early Anglo-exploration, the river was just a barrier to be crossed while seeking the best path for the rail line’s expansion. The scouting party, joined by geologist Sir James Hector, struggled through the timber-strewn shoreline of the Kicking Horse River. "...the banks were so steep that we had great difficulty in getting him out. In attempting to re-catch my own horse, which had strayed off while we were engaged with the one in the water, he kicked me in the chest, but I had luckily got close to him before he struck out, so that I did not get the full force of the blow." As a result, the river, and a nearby mountain pass were dubbed “Kicking Horse” by the railway’s team of explorers. The name—now the title of Golden’s world-famous ski resort, Invermere’s equally world-famous coffee, and home to one of the greatest adventure playgrounds in the world—stuck. It wasn’t just a wild river that Kootenay railway expansions helped uncover. A few Kootenay national parks can thank railroad expansion and its scouts—including Sir James Hector’s party, mentioned above—for their existence. And Canada’s mountaineering adherents can thank them, too. Take, for example, Yoho and Glacier national parks. The area now comprising Yoho National Park enthralled geologist Sir James Hector with its formations, pushing him deeper into the land to see what it held and eventually leading to the naming of Kicking Horse Pass and Kicking Horse River. Later, to uphold the condition set by British Columbia to join the Canadian confederation, a connection from the rest of the nation to the future province needed to be constructed via railway service. But in order to realize this connection, the railway’s westward expansion needed to first overcome a massive obstacle: the Rocky Mountains. After a number of efforts proved futile, a solution was finally born. Yoho’s Spiral Tunnels, an engineering feat in 1909, resolved the problem of the rail’s safe passageway through the steep grade of Kicking Horse Pass. To promote tourism to the area, the land surrounding the Spiral Tunnels was designated as parkland by the government and eventually became present-day Yoho National Park. In the area that constitutes present-day Glacier National Park, a similar fate would be realized. Recognized as the birthplace of mountaineering in North America, the first technical ascent in the continent was completed in the park’s mountains in 1888. In those days, the park was only accessible via railway and guests overnighted in the CPR’s Glacier House Hotel, in the midst of what would become known as the “cradle of mountaineering”: Rogers Pass. Acknowledging the popularity of mountaineering and its draw on tourists, CPR hired professional Swiss guides to boost the accessibility of the sport for the railway guests staying at the hotel. “The mountain guides that came from the Swiss Alps to work for Canadian Pacific Railway (CPR) hotels between 1899 and 1954 led hundreds of first ascents and taught safe climbing techniques to thousands of climbers … The Swiss guides and Swiss skiers contributed significantly to a mountain culture for which western Canada is renowned today.” Spaar, I. (2010). Swiss Guides: Shaping Mountain Culture in Western Canada. Those guides are largely responsible for the trail systems that are still in use with present-day climbers in Glacier National Park. Used as an outpost by CPR as it built its westward expansion, Golden is the product of the railway. After the completion of the cross-country line just west of Revelstoke, the outpost became a central hub of activity for the transcontinental line, with an enduring community arising from this activity. The railway still frequents Golden today, though the town is also accessed via the Trans-Canada Highway, a Canadian thoroughfare that owes at least part of its existence to the original CPR route. Like the past, visitors to Golden today also use the town as a hub, but largely as one of adventure. Like Golden, Fort Steele was once a thriving centre of activity within its region—but it was soon to be overshadowed by a nearby outpost: Cranbrook. “... [in 1892] major deposits of silver, lead, and coal were discovered nearby. Prospectors flooded the valley once more, and … Fort Steele became the region's commercial, social, and administrative centre ... In 1898, the local “Prospector” newspaper listed the town’s thriving businesses, including 11 hotels, 4 restaurants, 4 general stores, a hardware store, a brewery, and a wide assortment of other establishments ranging from a Chinese drug store to tailor shops and barristers. “Entrepreneurs installed telephone and telegraph services in 1897. In the spring of 1898, a waterworks system was installed along Riverside Avenue, reducing some of the townsfolk’s dependence on barrels of muddy water hauled up from the Kootenay River. “The boom at Fort Steele began to slow in 1899 … The previous year, the long-awaited Crowsnest Line of the Canadian Pacific Railway had bypassed Fort Steele in favour of the fledgeling community of Cranbrook. Fort Steele’s land values and population plummeted as Cranbrook attracted the tradesmen and merchants. Finally, in 1904, the Provincial government offices were moved to Cranbrook and by 1910 Fort Steele was in a state of sharp decline."